Horus. . Wallpaper and background images in the The Kane Chronicles club tagged: the kane chronicles red pyramid horus. This The Kane Chronicles photo might contain 日落日出, 日落, 日出, 动漫, 漫画书, 漫画, 卡通, 漫画卡通, 肖像, 爆头, 特写镜头, 特写, and 爆头特写. 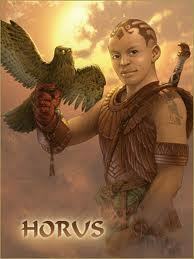 No offense Horus AND Carter!!!!!!!!!!!!!!!!! I pictured him more...what are the right words, old? I saw an African American Ares.